Eleven Credited Missions: 3 (22 Nov 42), 4, 9, 11, 14, 20, 23, 25, 26, 27, 28 (4 Apr 1943). 1Lt Ercil F. Eyster (P)(KIA) - 11 credited Missions flown: Mission 4 flown as CoPilot with Maj. George L. Robinson, Other missions flown as First Pilot. 2Lt Fred H. Hayward (CP)(KIA) - 12 credited missions flown: With 1Lt Eyster (3, 6, 9,11, 14, 20, 23, 25, 26, 27, 28); With 1Lt Ross C. Bales (18, 21). 2Lt Jackson P. Gilliam (N) - 2 credited missions flown: All with 1Lt Eyster (3, 4). 2Lt William P. Cargill (B) - 12 credited missions flown: With 1Lt Eyster (3, 9,11,14, 20, 22, 23, 25, 26); With Lead Crew Capt William R. Calhoun, Jr. (5, 21); With Capt Ross C. Bales (32, 33). T/Sgt Harold J. Dunham (E-KIA) - 8 credited missions flown: With 1Lt Eyster (3, 4, 9, 20, 23, 25, 26, 27, 28); With 1Lt Stanford T. Smith (21)(Aborted). T/Sgt Raymond K. Roberts (R-KIA) - 26 credited missions flown: With 1Lt Eyster (3, 4,9,11, 15); With 1Lt William J. Cline (43);With 1Lt Guy H. McClung (40, 42, 43A, 44, 47, 48, 49, 51, 52, 54, 55); With 1Lt Robert L. Phelps, Jr. (75,76,77): With other Pilots (7, 41, 50 (Lead Crew), 61 (Flown as photographer), 83). Killed in Action on mission 83, 26 Nov 1943, to Bremen, Germany in B-17F 42-5177 Fast Worker Mk II (359BS) BN-U. . Was shot and killed by ME-109 cannon fire. The damaged B-17 was flown back to Molesworth. T/Sgt Roberts is buried in the Cambridge American Cemetery. S/Sgt Marcus K. Davis (BTG) - 7 credited missions flown: With 1Lt Eyster (3, 4, 6, 9, 11, 14, 19 (As Radio Operator); With 1Lt Hans C. Johnson (18). S/Sgt Marvin F. Powell (WG/E) 27 credited missions flown: With 1Lt Eyster - As Waist Gunner (3, 9), As Engineer (11, 14); With Capt Sanford T. Smith (41, 43, 43A, 44), With Capt Jack Roller (45), With 1Lt James S. Nix (47, 58, 60), With 1Lt Guy H. McClung (52, 54, 55), With 1Lt Robert L. Phelps, Jr, - As Engineer (70, 71, 72, 73, 74, 75, 76, 77, 78), With 2Lt Harold S. Bolsover - As Engineer (82, 83), With Maj Mackin and 2Lt Bolsover - As Engineer (88). Completed combat tour on 13 Dec 1943 - The only original 1Lt Eyster crewman to complete a combat tour. T/Sgt Robert C. Altizer (WG,TG,TOG- POW) - 11 credited missions flown: With 1Lt Eyster - As Waist Gunner (3, 4, 9, 11, 14, 20, 25, 26, 28), As Tail Gunner (23), As Togglier (27); With 1Lt Sanford T. Smith (21 - aborted). S/Sgt Floyd E. Bauer (TG-KIA) - 8 credited missions flown: All with 1Lt Eyster (3, 4, 9, 14, 25, 26, 27, 28). Mission 28, 04 April 1943, in B-17F 41-24609 Holy Mackerel (359BS) BN-Q. Shot down by German fighters and crashed near Rouen, France (MACR 15609). 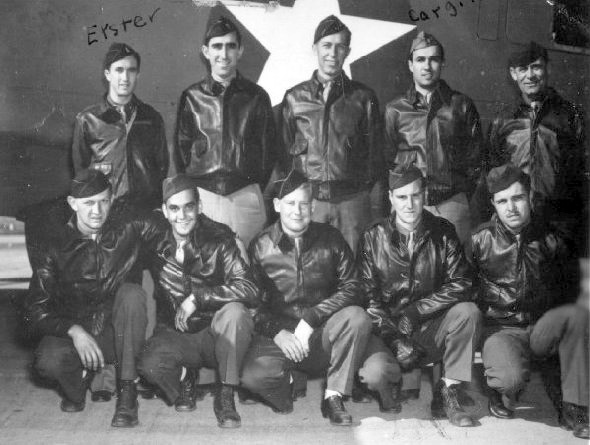 Six original 1Lt Eyster crewmen on mission 28 - 1Lt Eyster (P-KIA)(*), 2Lt Hayward (CP-KIA), S/Sgt Davis (Tog-POW), T/Sgt Dunham (E)-KIA)(*), S/Sgt Altizer (RWG-POW) and S/Sgt Bauer (TG-KIA). Four substitute Crewmen on mission 28 - 2Lt John D. Shanks (N-KIA)(*), Sgt Edmund R. Thornton (R-POW), Sgt Eugene A. Nicosia (BTG-KIA), Sgt George T. Morton (LWG-POW). (*) Three crewmen buried in the Normandy American Cemetery near Coleville-sur-Mer, France.